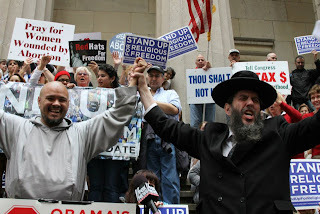 Rabbi Levin at the March for Life Rally - 2010 | RabbiLevin.com - Fighting for Morality! I appreciated your very inspirational speach at the March for Life last week. Keep up the good fight! Great Statements at the "March for Life". I liked your statements so much I had to Google your name. Thank you and keep up the Great Work. You're not a Jew, Rabbi Levin. You're an Evangelical Baptist in his worst form. As a Jewish woman I am ashamed that you are a Rabbi. Stop discriminating against homosexuals and women and go act like a true religious leader. Instead of marching alongside a bunch of gentiles who hate the constitution, go over to Haiti and do something that matters. Shame on you.